• Wetland ecosystems occur in slightly depressed landscapes where there is flooding and poor drainage. Water depth fluctuates but is generally less than 2 metres. These ecosystems feature wet soils and moisture dependent plants that thrive where abundant fresh-water is available daily or seasonally. • Wetlands act as giant sponges by capturing and storing water that aids in groundwater recharge and flood control. They are one of nature’s primary purifiers; as water moves through a wetland up to 90% of sediments and toxins are removed. • Wetlands provide some of the most biologically diverse, productive and important life support systems on earth. 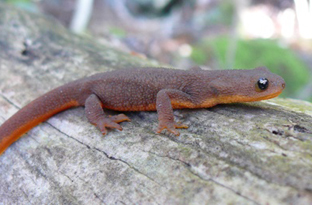 They provide critical habitat for amphibians, reptiles, fish, birds, and other wildlife. 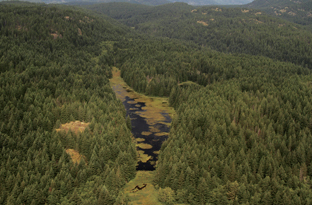 Most wildlife in BC use wetland habitat at some point in their life cycle, and many red and blue-listed species are dependent on wetlands. DIEM has mappedWetland Ecosystems frog green in the Sensitive Ecosystems Mapping. Wetland ecosystems are submerged for sustained periods and they are covered with vegetation that is influenced by the water level as well as the soil’s low oxygen, degree of acidity, moisture, and nutrients. In the Discovery Islands, relatively large wetland ecosystems are distributed throughout most of the larger islands, and small wetlands occur in slight depressions among other ecosystems. All 5 kinds of identified wetlands occur: bogs, fens, marshes, swamps, and wet meadows — which sometimes join as a complex mosaic of wetland type, and with other aquatic features such as ponds or lakes. 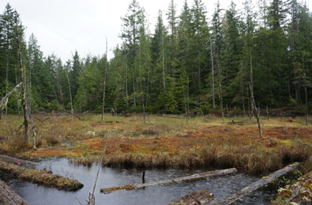 Swamps and marshes are the most disturbed due to logging operations or draining for farming. 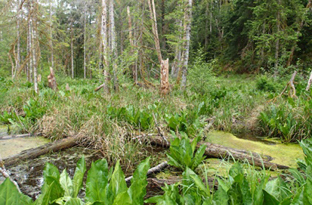 Because of the transitional zone they occupy between aquatic and upland habitats, many wetlands support a wide range of plant and animal life from both habitats. 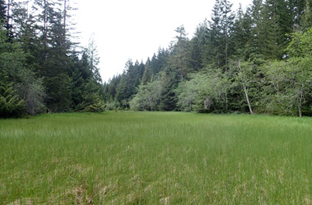 Typical wetland species include floating aquatic plants, emergent grass-like vegetation such as rushes and sedges, hummock-forming moss, water-tolerant shrubs, and sometimes trees. Migrating waterfowl stop at wetlands every year to feed, stage, breed and nest. 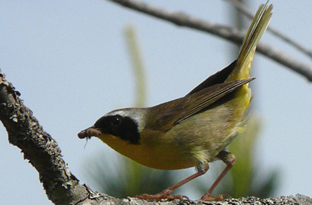 Wetlands are highly productive ecosystems that support diverse populations of migratory waterfowl, shore birds, song birds, raptors and amphibians – as well as well as small mammals and unique communities of insects. 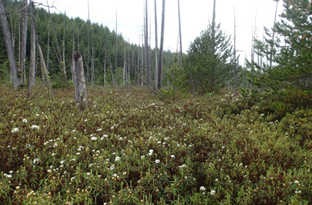 BOG – nutrient-poor, acidic wetland that supports Sphagnum peat-mosses and shrubs such as bog-rosemary and Labrador tea. Their primary source of water is from rainfall. FEN – nutrient-medium peat-land, receiving some mineral-bearing ground water. 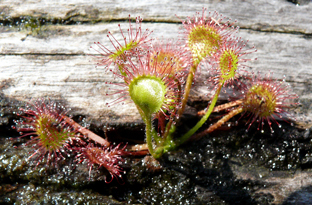 The dominant vegetation consists of brown mosses and sedges. MARSH – nutrient-rich, permanently or seasonal flooded, and usually dominated by a few grass-like species (grasses, rushes, sedges) that grow up out of the water. Salt-marshes in estuaries usually experience diurnal tidal flooding. SWAMP – wetland with sufficient dry period or micro-sites elevated above the water-saturated surface, so that at least 25% is covered with flood-tolerant trees or shrubs. 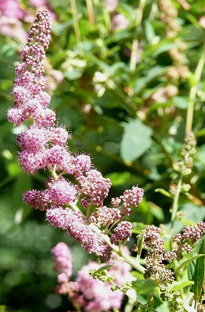 There is a well-developed low plant (herb) layer and an abundant inflow of freshwater rich in nutrients. 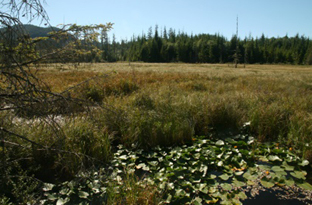 SHALLOW-WATER WETLAND – permanently flooded up to 2 metres in depth, where rooted vegetation has leaves either floating or submerged, and where less than 10% is covered by vegetation growing above the surface. 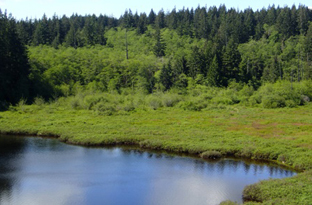 Shallow-water wetlands may provide the transition to Freshwater Pond and Lake ecosystems. 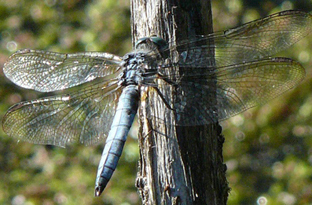 The blue dasher’s distinctive yellow markings are covered by blue-grey colouring in mature males. 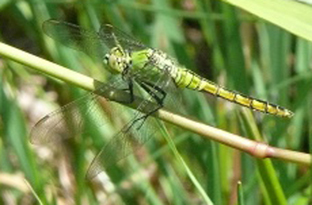 While common in southern North America and on the Vancouver Island area, these dragonflies are less common in the rest of BC and are blue-listed. 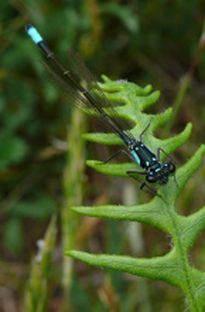 They are common in wetlands with vegetation in the water, on which they perch with wings often cocked downward. This is a small frog with toe-pads that enable it to climb almost anywhere and with a voice that in springs joins a loud mating chorus in most available water bodies. The bumpy skin and nose to shoulder black stripe are other distinguishing features. 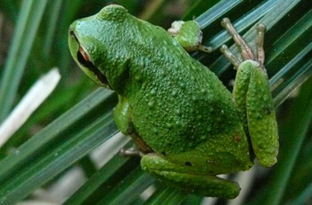 These frogs are able to change colour slowly to suit some colours of their habitat and are often a variety of green, brown or grey with various black markings. This tea grows in peatlands and is famous in name for an aromatic tea made with boiled leaves. High doses of the tea may cause excessive urination or intestinal upset. 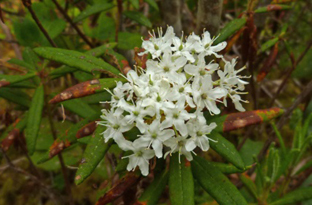 The leaves should not be confused with those of the similar-looking trappers’ tea, which have white-haired undersides instead of reddish-haired, contain toxic alkaloids and should not be used for tea. In the Discovery Islands, relatively large wetland ecosystems are distributed throughout most of the larger islands, although Cortes, the Redondas, and the smaller islands have few or no mapped wetland ecosystems.